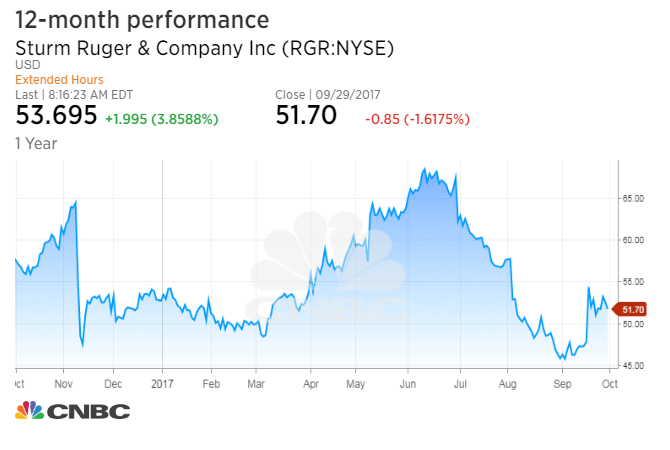 Shares of Sturm Ruger and American Outdoor Brands rose more than 3 percent. At least 58 people died and more than 500 people were sent to hospitals after suspect Stephen Paddock, 64, opened fire at a Las Vegas concert in what was apparently the deadliest shooting in U.S. history. The gains in the gun stocks apparently came as traders bet on a pickup in arms sales ahead of potentially tighter regulations. Police officers point their weapons at a car driving down closed Tropicana Ave. near Las Vegas Boulevard after a reported mass shooting at a country music festival nearby on October 2, 2017 in Las Vegas, Nevada. Shares of gun stocks rose Monday after at least 58 people died in Las Vegas in what was apparently the deadliest shooting in U.S. history. Sturm Ruger closed up nearly 3.5 percent. American Outdoor Brands, formerly Smith & Wesson, rose 3.2 percent. Suspected gunman Stephen Paddock, age 64, of Mesquite, Nevada, opened fire late Sunday night at a concert across from the Mandalay Bay hotel on the southern end of the Las Vegas Strip. In addition to killing at least 58 people, the shooting injured at least 515 people, according to a sheriff. Police said Paddock is dead. The FBI said the shooting has no connection to international terror. The gains in the gun stocks apparently came as traders bet on a pickup in arms sales ahead of potentially tighter regulations as a result of the shooting. They may also be betting sales increase as consumers look to more heavily arm themselves for protection in the wake of the shooting. After the Orlando, Florida, and San Bernardino, California, shootings, "you saw a two- to three-month surge in firearms sales," said Rommel Dionisio, managing director at Aegis Capital. The two ISIS-linked attacks "certainly triggered something in the American consciousness about personal safety." Although a national change in gun ownership laws appears unlikely, "certainly on a state-by-state basis you can see states pass tighter gun control laws," Dionisio said. Some leading Democrats, who often support tighter restrictions on guns, called for more action to prevent future mass shootings in the wake of the Las Vegas massacre. Gun stocks have tended to rise after similar shootings. 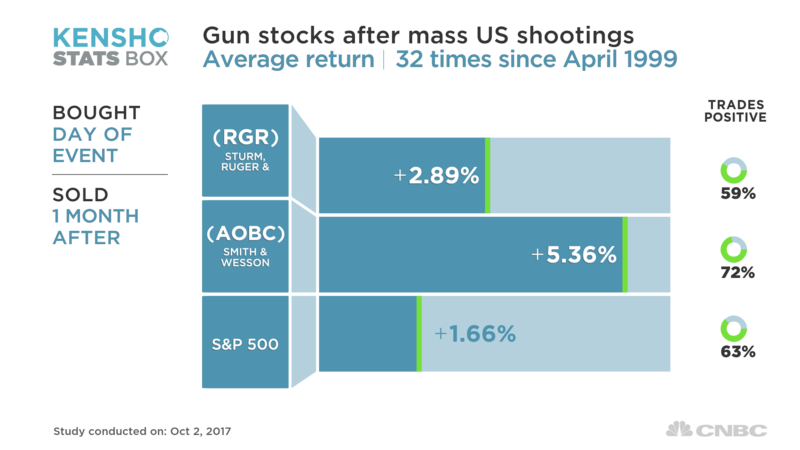 In the month after mass U.S. shootings, Sturm Ruger shares climb an average of nearly 2.9 percent and American Outdoor Brands rises almost 5.4 percent, according to analysis using Kensho, a quantitative analytics tool used by hedge funds. The study looked at 32 instances since the Columbine High School shooting in April 1999 in Colorado. The two gun stocks have fallen sharply since President Donald Trump's election win in November. Gun sales had climbed ahead of the election on expectations a Democratic victory would increase restrictions on purchases. After Trump's win, sales of the weapons dropped and so did the shares. As of Monday's close, American Outdoor Brands stock was down 25 percent for the year. Sturm Ruger shares recovered positive territory for the year, up 1.5 percent. Disclosure: CNBC's parent NBC Universal is a minority shareholder in Kensho.